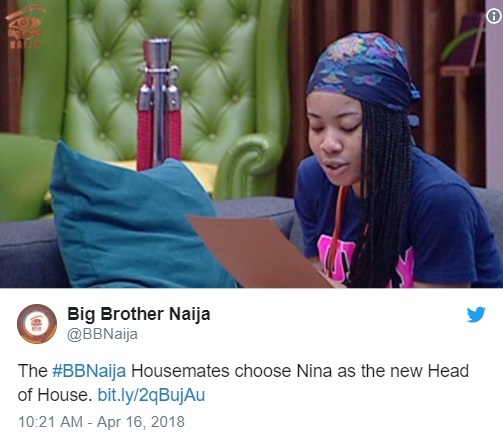 Nina has been unanimously voted as the new Head of House by fellow housemates of the ongoing Big Brother Naija reality television show. The remaining Big Brother Naija housemates have unanimously chosen Nina as the new Head of House for the final week. The Housemates joked about the Head of House duties saying it’s to change batteries but for someone who hasn’t experienced it, it would have been a chance. Alex, Cee-C, Miracle, Nina and Tobi are the finalists for this season of Big Brother Naija.